Hoe and Shovel: Bogs to the Grocery Store? Bogs to the Grocery Store? When I purchased my Bogs this fall while on a road trip (in another state) I thought it was kind of a frivolous buy. For wearing later in Florida? I honestly didn't think I'd get much use from them. At the time I didn't care because it had gotten colder than we had expected and we were heading to a football game in the pouring down (did I mention cold?) rain. Surprisingly, since then, they have become my gardening shoe of choice. I still love my Birki's mules as my all-time go-to gardening kicks. But for winter gardening my Bogs have stolen my heart. As for the grocery store on a soggy day or running to the organic co-op to volunteer in the rain? My flower design Bogs have really come in handy donned with a pair of jeans. And they're cute don't you think! They've kept my toesies warm and dry more than their money's worth this unusually wet winter. 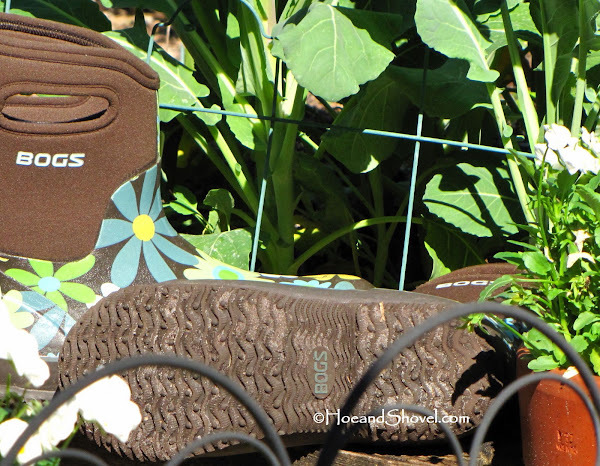 Do you have a favorite gardening shoe? Oh, Meems! Those are absolutely adorable! How perfect for sloshing around in! Good choice! I really like them....Good Buy!! They really look at home in your garden. Good morning Meems, I love the handles on your bogs. My favs were some leather clogs I had purchased from Cabelas, they lasted a year and I accidentally left them outside while I was away and they got rained on several times. The sun hardened them and they had shrunk and were useless. Boy they were comfortable. I am making do with some sloggers. At least they are waterproof! Have a great day my friend! Those are adorable, I have a pair of slip on Keds, that are looking awful, but I'll wear them until they are totally blown out. P.S. When and how do I divide a pot of the Pink Muhly grass? Thanks. I don't really have "gardening" shoes. I bought some of those hard rubber shoes years ago.THey sit by the backdoor but I use them mostly for short trips to the mailbox or just to putz around in. When I do serious work I wear sneakers. Your flowery boots would go anyplace. They are quite the rage now. I see young girls wear them everywhere. So cute! I have some comfy gardening Crocs I wear, no where near as cute as yours! Last year I bought a pair of Chooka rubber boots with pink hearts all over them. During our yard makeover my feet were just getting filthy from the serious digging and shoveling, and I HATE dirty toenails. The boots were the perfect solution. They were hot but I decided that was a fair tradeoff for CLEAN TOES. And, people walking by our house always commented on my boots when I was working in the front yard, which gave me a great excuse to take a break from the manual labor. 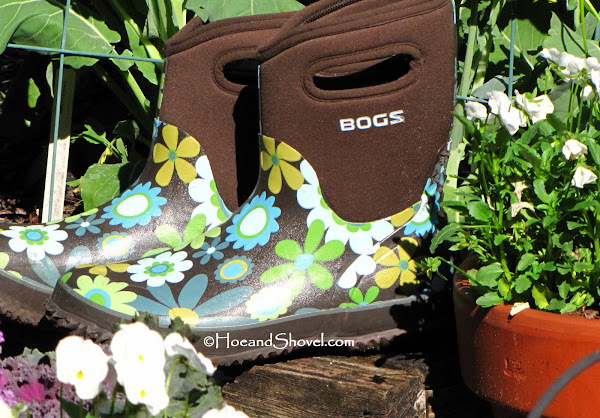 Oh arent they cute :) For some reason I resisted crocs at first but now they are my favourite gardening shoe - when they get all muddy I can just hose them off! Like Floridagirl, I do always have to tip out any creepy crawlies before I put them on! what a great choice for a gardening go to shoe and the grocery isle as well. You would look good wearing anything, dear Meems! It's all about attitude ... how fashions trends start. I think my wife and daughter will appreciate your bogs more. ;-P I usually just wear rubber flip-flops when I garden. Not so fashionable, no? I just saw a young girl at the mall with some of those. Maybe it was YOU! Those are really cute. I wear orange gardening clogs that need to be replaced. And, no I don't wear them to the store. And, yes, I'm going to get a different color. Sloshing is one thing they do perfectly. Still working on the name of that blue plant for you. Don't give up on me. 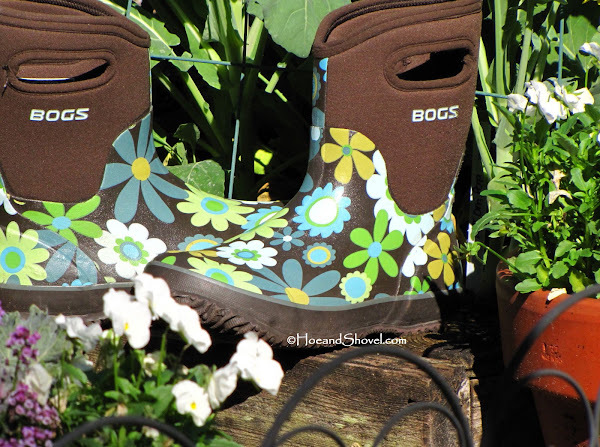 :-) The flowers on the boots blend scrumptiously in the garden don't they? Good morning, dear friend. So nice to see you. Leather would never do here either for the beauty of these and my everyday garden clogs is the fact they are weather proof. I hope you can find a good replacement you adore! I fear keds would not be enough support for my tootsies on an all day venture in the garden. But when you find a favorite anything ~~it just works. RE: Muhly... I have not divided it. But if I did I would do it like I have done all my other grasses... dig up the entire plant cut it in half or thirds and simply transplant it. Keep it moist until it roots. I did whack it back completely (last week) to allow all new growth to come out for this year. Hope that helps. My everyday mules from Smith Hawkin and Birki have lasted a VERY long time. I was just driving through Arcadia on Wednesday. It was a glorious day!!!! It seems a lot of gardeners choose Crocs. If I wore flip flops in the garden it would surely un-do my pedicure making it impossible for me to wear (my usual) flip flops/sandals to the grocery store. :-) I don't worry about the critters as much as dirt in my toes. Critters in my clogs seem easier to rid. We are on the exact same page with HATING dirty toenails. I bet your boots are so much fun!!! They probably came in handy like mine on a rainy day elsewhere or a soaky garden day, too. I'm sure I won't be wearing my Bogs much longer this season as it is getting too warm for them. My everyday Birki's are also waterproof and worn with footie socks to avoid as much dirt seepage as possible. Footies help with missed critters, too. You know I don't have to be concerned with snow but amazingly my Bogs were just what I needed to garden this winter. They have a cushy, warm lining and I never had to worry about splashes or sand... especially good for the compost pile... man that stuff is rich and thick when it gets stuck in my Birki's. You are my friend for certain now!!! :-) I do love fashion... even in the garden. Oh, I'm sure the "young girl" was probably me. :-) As you probably know we don't subscribe to anything 'orange' around here. They would have to be say... garnet or gold if I had some. But Crocs would do me in with the vents on the top capturing sand and what-not into my toesies. Let me be clear (ha)... I do not wear my other garden crocs to the store. They are not cute!